These recordings have been well and justifiably praised since their initial release; the Staatskapelle is one of the oldest and finest of Germany's many outstanding orchestras,and take pride in having premiered several of Strauss' operas and were a favorite orchestra of the composer/conductor. Kempe, who was born and trained in Dresden, began his musical career as an oboist, perhaps explaining why his performances stand out for their transparency particularly in woodwind detail. Listening to his performances of the many popular tone poems, what immediately distinquishes them from the competition is the way he often holds back the brass or tutti ensemble to reveal much of the delicate interior wind writing. In short, both the orchestra and their conductor know their Richard Strauss! II. Scherzo; Parents' happiness. Childish play. Cradle song [quotation from Felix Mendelssohn's "Venetian Boat Song", Op. 19b, No. 6 from Songs Without Words] (The clock strikes seven in the evening). III. Adagio; Doing and thinking. Love scene. Dreams and cares (the clock strikes seven in the morning). IV. Finale; Awakening and merry dispute. Joyous confusion. 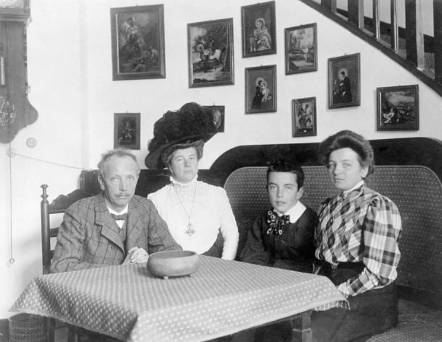 Strauss’ violin concerto was written during the composer's teenage years while he was still attending his last two years of school, and is less distinctive than many of his later orchestral works. Despite this it contains some bold and inventive solo writing as well as occasional passages that hint at the composer's mature harmonic style. Though written in the romantic tradition, it hints at the young composer's reverence of masters of the preceding classical period, especially Mozart and Beethoven. Although it is today rarely performed, it received encouraging reviews.